Reducing the humanitarian impact of the use of explosive weapons in populated areas is a key priority for the United Nations, the International Committee of the Red Cross (ICRC), civil society and an increasing number of states. The current and past United Nations Secretary-General have repeatedly called on parties to conflict to avoid the use in populated areas of explosive weapons with wide-area effects. While the use of explosive weapons in populated areas may in some circumstances be lawful, the evidence reveals a foreseeable and often widespread pattern of harm to civilians, particularly from explosive weapons with wide-area effects (see for example this report from INEW members Article 36 and PAX). There are however important examples of policy and practice where military forces have deliberately avoided or limited the use of certain explosive weapons in certain contexts in order to ensure greater protection for civilians. 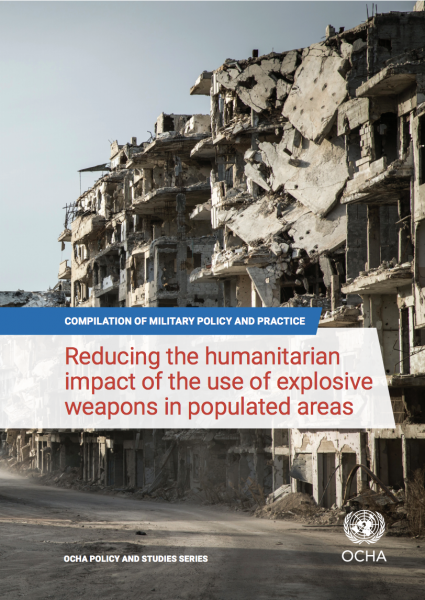 A new report by UNOCHA compiles a range of such examples to inform States, militaries and others on this critical issue, and assist in the identification of practical steps that can be taken to limit the impact of the use of explosive weapons on civilians. Some case studies of policies that have reduced the impact of the use of explosive weapons in populated areas have been documented or are at least known to states, such as changes to international airstrike policies in Afghanistan, and AMISOM’s placing restrictions on indirect fire weapons in Somalia. In this context, UNOCHA concluded that it would be beneficial to compile a broader range of policies and practices from states in order to guide the development and implementation of commitments on the curbing of the use of explosive weapons in populated areas.